Do You Feel Cold from Not Eating Enough Calories? If your eating plan is leaving you cold, you may not be getting enough calories in your diet. Low body temperature is just one of the many repercussions of very low calorie intake. Following such restrictive diets can affect your metabolism and cause serious medical issues. It also deprives your body of important vitamins and minerals needed to keeping your body functioning. Speak with a doctor or other health care professional if you're experiencing such consequences. Very low calorie diets are sometimes recommended for weight loss in cases of morbid obesity. These diets should only be followed under medical supervision. Although VLCDs are effective at losing a significant amount of weight in the early stages, the possible consequences of such low caloric intake make them risky. Following such a diet can cause cold intolerance, fatigue, hair loss and gallstone development, according to the University of South Florida's Dr. Robert Campbell. Severely restricting your caloric intake may be a sign of an eating disorder, particularly if you are preoccupied with your appearance and weight, or feel excessively guilty when you feel you've eaten too much. 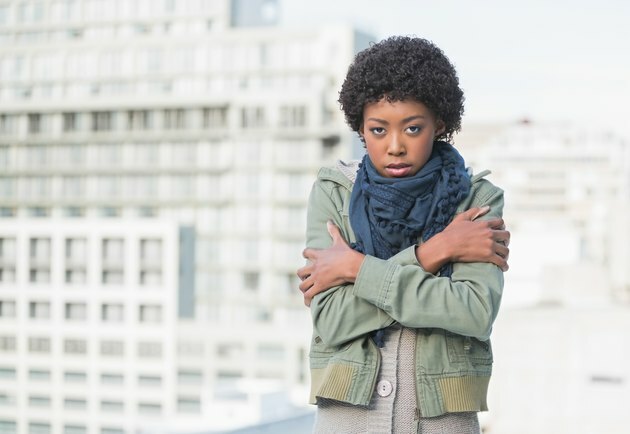 Feeling cold is a common symptom of eating disorders. The lack of caloric and nutritional intake affects your body's ability to carry out normal functions, such as maintaining body temperature. Eating disorders affect your metabolism, which is the way your body breaks down food for use in the body. Getting enough calories is essential to keep important bodily operations, including breathing, going. Severe calorie restriction can lead to hypotension, or low blood pressure. This can cause cold or clammy skin. Low blood pressure also causes dizziness and puts you at risk for fainting. You may even suffer heart or brain damage if your blood pressure is severely low. Following a severely restrictive diet may cause dry skin, gallbladder inflammation and irregular menstruation as well. You are also at risk for developing anemia, a condition in which your red blood cells can't provide enough oxygen to your body's cells and organs. Feeling cold is a classic sign of anemia. Severely reducing your caloric intake is not a healthy way to lose and maintain weight. Dr. Campbell points out that while VLCDs are effective in the beginning, many patients regain the weight. In addition, low caloric intake slows down your body's ability to burn calories, making weight loss even more difficult. If you're overweight, your doctor or a registered dietician can help you develop a healthy approach to weight loss. Speak with a professional if you're struggling with body image or have the signs of an eating disorder. Continually feeling cold is a sign of a health problem.